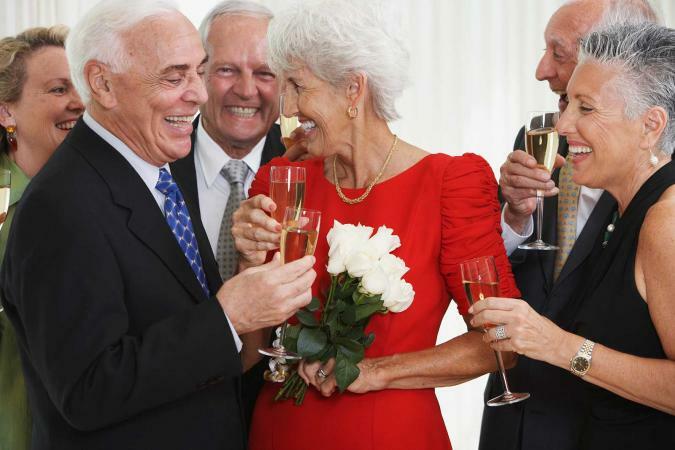 There's no better way to mark a 50th anniversary than by holding a celebration, and this means you will need invitations to let your guests know when and where the party will take place. Free printable invitations can help keep the event within your budget, but you can also purchase invitation downloads online that you can print. Your choice ultimately depends on which design strikes your fancy. All of the free, printable invitations on this page can be customized with your own party info. Choose from a festive champagne glass design, a pretty scrolled framework design with the number 50 watermarked beneath the wording, and a gold frame design with space to insert a photo of the anniversary couple. You'll need to use Adobe to download the design you want, and then you can make your changes and print out as many invitations as you need. It's usually best to print a single copy and proofread it thoroughly to make sure there are no typos before you print the rest. Your invitations will look nicest if you print them on high quality invitation paper, and you can find paper and envelope sets at most office supply or craft stores. 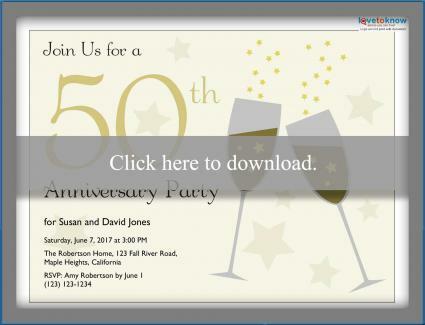 The following websites offer a variety of designs built around a 50th anniversary theme. Some are free, and some are for purchase. 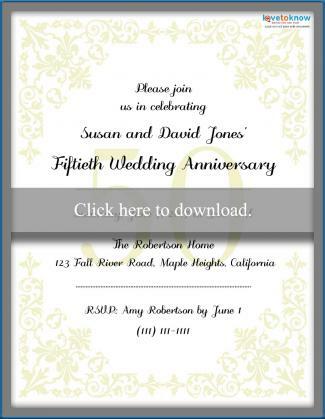 Best-Printable-Invitations: This website offers free downloadable invitations you can print and fold into cards. Although the selection isn't big, design choices include a silhouette of a bride and groom, a set of golden wedding rings, and Victorian bride and groom children sharing a big umbrella. PurpleTrail: This company has a wonderful assortment of 50th anniversary invitation designs, which are fully customizable. 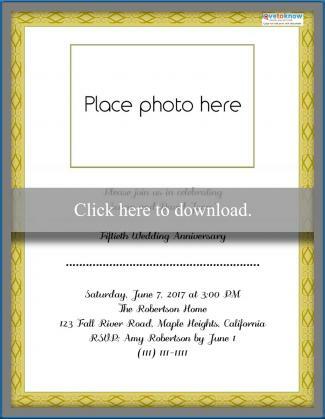 Designs include a lovely gold and black damask invitation, various photo insert options, a "We Still Do" design, and many more. Once you've customized your selection, select the "print from home" option during check out. Prices begin around $19 for downloads. A 50th anniversary deserves to be celebrated. Select an invitation that reflects the style of the party you plan to hold, whether it will be a formal occasion or a more casual gathering, as well as the style of the couple being honored. Remember, the invitation gives guests an idea of the tone of the event, so choose wisely and have a wonderful celebration.